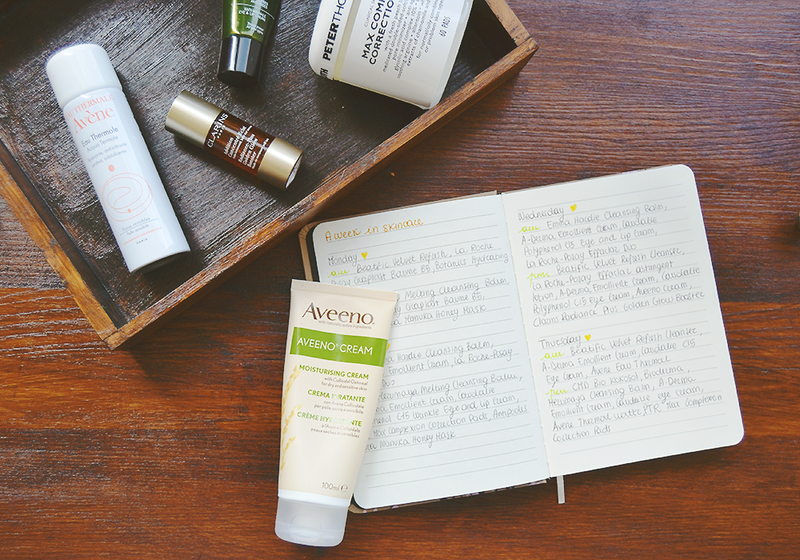 Since when Annabel from Fragmented Splendour came up with the idea of keeping a skincare diary last year, I tried keeping one myself, but to be honest is not that easy as it sounds and I always forgot to keep annotating my skincare routines during the week. This last time though, I took it really seriously as I think this not only can be a great and interesting feature to read regularly on a blog, but also can be super helpful for me to understand which product I do really use and which I shall not repurchase once finished. I thought I could share it with you as well, as I always love reading about what other bloggers really use on a daily basis rather than reading a product’s review, and so may do a lot of you. I really love the Beatific cleanser in the morning as it’s very lightweight and creamy while it deeply removes every little residue of what I put on my face the night before. I’m also testing the La Roche-Posay baume which is thought to suit eczema and dryness, but as you will see, even though I’m really liking it, I’m still pretty loyal to another eczema treatment. On Monday evening I had a pampering 10-15 minutes with my beloved Antipodes Aura Mask just before bed, and I really can’t describe how relaxing this is every single time! Whenever I feel my skin is a bit too dry and needs a boost I always rely on the Emma Hardie Cleansing Balm and recently I’m using it without removing it with a muslin cloth to allow the oily film it creates to stay on my skin and really hydrate it from the inside. On Tuesday I went back to my other eczema treatment, the A-Derma emollient cream which is phenomenal and can’t really be replaced. I love the Merumaya cleansing balm in the evening as it removes all the residue of makeup or impurities your skin accumulated during the day, plus it’s very easy and quick to use, and I’m kind of starting loving the scent as well! Whenever I see some little spot making their way on my skin I always go for the PTR pads, which contains a good dose of BHAs which are my most loyal allies against breakouts, and then go on with my Antipodes mask placed only on those big spots as having anti-inflammatory properties, I find it really helps in reducing the spots appearance and the next morning 50% of the redness is gone. I’m testing the Caudalie Polyphenol C15 range and as you’ll see from one of my posts coming soon on here, I’m particulary loving the eye and lip cream, which I only use on my under eye area and which I mainly love for its hydrating properties and for being super gentle. The day after a good acne treatment I always apply my Effaclar Duo, which containing BHAs helps in continuing the job against bad-looking spots. That day I looked in the mirror and saw a way too pale face and being that I needed to be at least decent the next day, I decided to provide some color to my face using a new entry in my stash, the Clarins booster, which is a self tanning serum to be mixed with a few pumps of your regular moisturiser. You’ll see it again super soon, but let’s just say I’m already in love! Again in the morning (and evening) I was loyal to my A-Derma eczema treatment and the Caudalie eye and lip cream, but to sooth my skin I also sprayed some Avene spring water which is so refreshing and such a relaxing step before makeup. Thursday was actually the only day I wore makeup this week (which is absolutely normal in my weeks) and so in the evening I went for my makeup removing routine with some organic coconut oil to remove my waterproof eye makeup and my beloved Bioderma to remove everything else. Also it was another evening for the PTR pads… those blemishes didn’t want to go away. But I’m trying to spare these pads and use them every other day instead of every night. This was the day I woke up to the news of my Google account being deleted and my blog with it, so I forgot about breakfast and my skincare routine until my eczema started hurting and I grabbed the first thing I found on my desk to sooth it. In the evening things went pretty standard but I used the Antipodes mask on those spots of mine again. From now on I’m afraid things can go a bit boring and repetitive, but I’m really sticking to this routine and my skin is a lot better if I do this instead of switching up things everyday. Those terrible nasty spots didn’t go away so I went for the PTR pads again and this was the definitive time. On Sunday’s morning I felt the need of a detox treatment so I went for the Decleor peeling gel which acts in only five minutes and contains AHAs to hydrate and exfoliate your skin. After using this my skin always feel so soft and reniewed. In the evening I decided it was the time for a new tanning session (which is still going on every night since then actually) as I looked so pale. I always love to go in with my Effaclar exfoliant lotion half an hour before using a self tanner as I find using a scrub or a chemical exfoliator really helps in avoiding getting bad looking orange stripes on my forehead (mainly). Also I like to use the Clarins booster paired and mixed with my Aveeno Cream as the latter has a slight oatmeal scent that covers completely the really light but still percepible biscuit-y/self tanner scent. This post was really fun to write, and if you wrote it as well please don’t be afraid to share it in the comments as I always love to read this type of posts! And maybe seeing what I really use on a daily basis can come helpful to some of you as well! I should try this, since I’m not the best at keeping habits. I’ll start next Monday. Everything starts on Monday!